Follow us on . For more info contact Koos Zietsman on +27 (0) 82 783 7463 or koos.ziets@gmail.com. 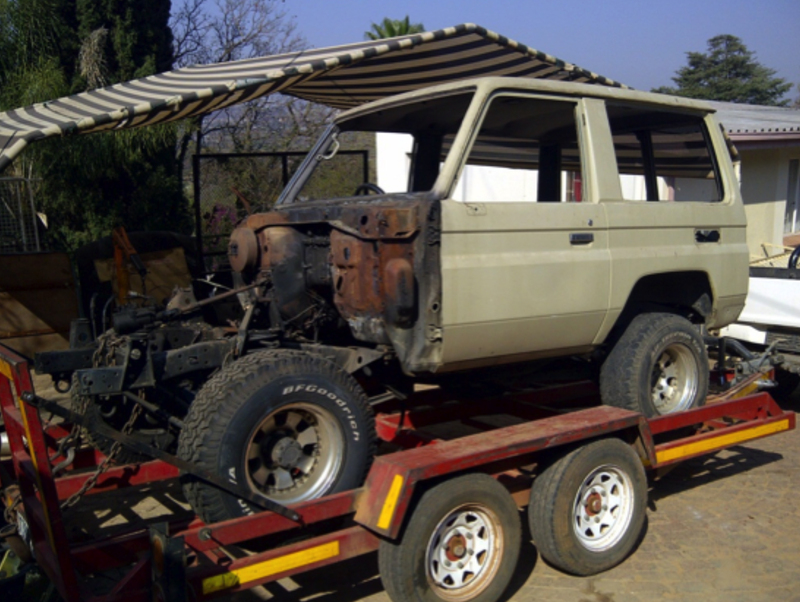 It all started with a burnt-out Toyota Land Cruiser LJ71 short wheelbase vehicle that we bought in August 2012. 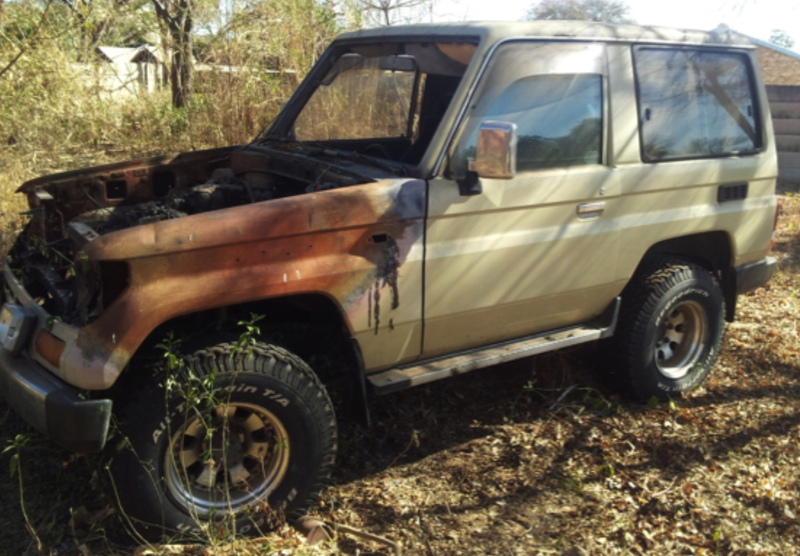 The start of Kwagga, a partially burnt-out 1993 Toyota Land Cruiser LJ71 - 17 August 2012. We removed the burnt Lexus engine and gearbox, fenders, bonnet, grille and windows and took the vehicle to Arno’s panel beater to repair the damage and spray paint it white. - 25 August 2012. Waiting for Kwagga to return from the panel beater felt like an eternity! In reality this process only took 5 weeks but the waiting drove me crazy! 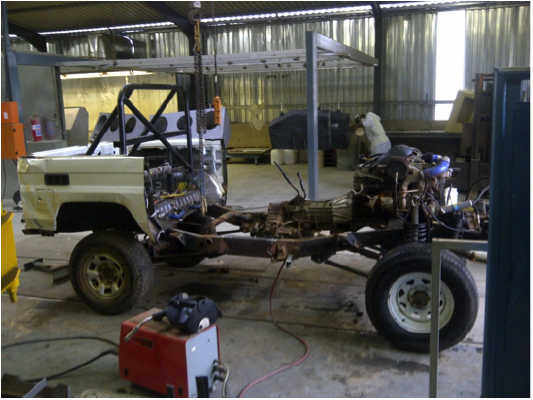 Trial fitment of engine, gearbox and transfer case - 29 September 2012. 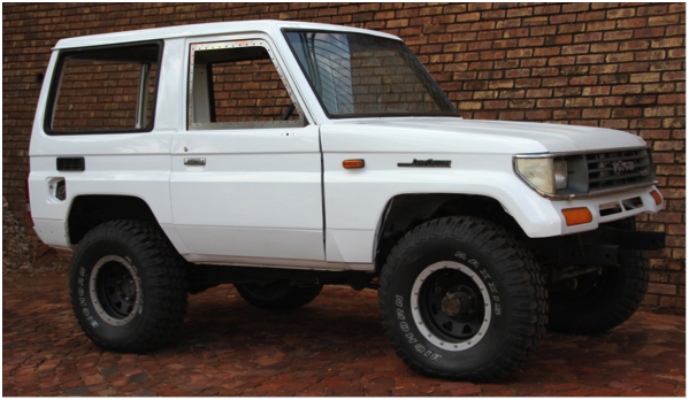 We decided to use a Toyota 1JZ straight-6 2.5 litre turbo charged petrol engine coupled to a Land Cruiser gearbox and the original Land Cruiser transfer case that was in the vehicle. We bought the engine from a dealer in Johannesburg somewhere. We were lucky enough to also buy a Toyota bell housing with complete clutch assembly from the same guy, this made the whole adaptation just so much easier! We put the engine, gearbox and transfer case together and slipped it into position in the vehicle for a fitment check. We then bolted the transfer case down onto the cross member, got the whole lot as straight as possible and started fabricating the engine mounts. Remag in Midrand sponsored us with a set of Megi Cone engine mounts that are great because the rubber part is positively captive which means that the rubber cannot shear off like in some lesser engine mounts. We bolted them to the standard aluminium engine mount brackets that came with the engine. We then used cardboard to mock-up the new engine mounts. Once this was done, Carl van Vuuren, owner of Wrought Iron Legends helped us by flame cutting the parts of the engine mount bracket out of 5mm steel plate. 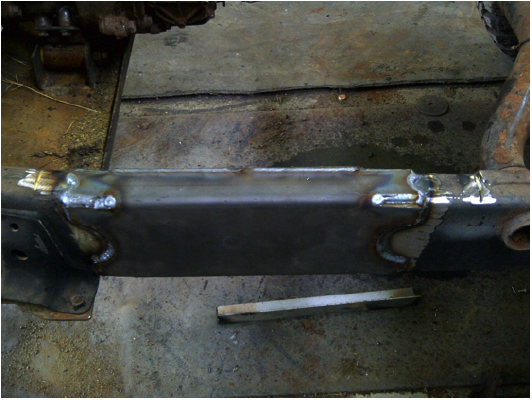 We tack welded the whole lot together and Carl helped us by having it welded in position onto the chassis. During the long wait, I designed new lightweight Z-Factor aluminium bead locks which were laser cut by Mechatrans in Benoni. Carl van Vuuren assisted by welding the backing steel ring onto a set of 16” x 8” Pro White steel rims. Once these were painted satin finish black, Ultimate 4x4 helped us to fit the new Maxxis Bighorn MT 285/75 R16 tyres ready for Kwagga’s return from the panel beater! During this time, I made measurements of the original coil springs, calculated the required spring rates and sent the details to Len Dockray from Mikem Suspensions who designed new front and rear coil springs for Kwagga. He then proceeded to have a set manufactured and these were ready for fitment when Kwagga returned from the panel beater. Around this time, I communicated with my friends at Bilstein in the UK who designed and manufactured purpose built dampers for Kawagga.These trick dampers are fitted with a number of tricks that they had developed over the years, many of these were as a result of pushing the boundaries while trying to stay ahead of the game with the RG32M Armoured vehicle that I designed and developed while at BAE Systems OMC. The dampers are fitted with remote cannisters to help keep the overal length as short as possible. It also sports a whopping 18mm thick shaft and foot valve in the cannister to ensure we enjoy reliable compression damping even at ridiculously high piston speeds. The package is rounded off with topping out sprinsg inside the dampers to avoid damage when we jump Kwagga. These were fitted together with the Mikem Springs and Z-Factor bead lock wheels and Kwagga stood on his own again. Kwagga back from the panel beaters, Z-Factor beadlock wheels, Maxxis Bighorn MT762 285/75 R16 tyres and Mikem Suspensions springs fitted - 8 October 2012. A week later we got together again and fitted the fenders, bonnet, grille and windscreen for a photo shoot, see picture below. Kwagga fitted with bonnet, fenders, grille and windscreen - 13 October 2012. Paul Jordaan helped us by generating a CAD file of the door windows which I used to have aircraft grade aluminium window surrounds laser cu by Laserfab near Ellispark in Johannesburgt. This design made it possible to fit the required netting over the hole where the window used to be in a neat manner. Trial fitment of the aluminium window surround - 13 October 2012. Measuring the space available for a radiator - 13 October 2012. With the nose fitted and the engine in place, we measured the space available for a radiator which we sent to Ventura Engineering to manufacture a purpose built radiator. 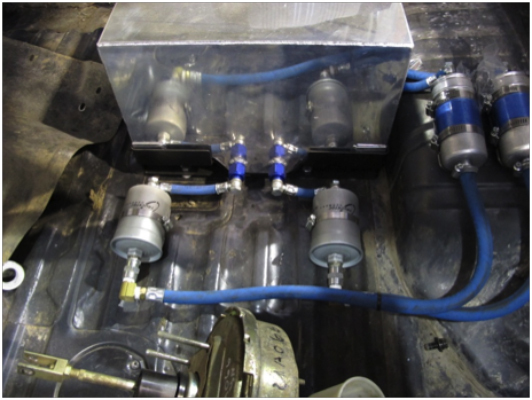 We bought an aluminium racing fuel cell from ATS and fitted it with dual high capacity fuel pumps and inline filters from Spitronics. We also bought a complete Spitronics engine management system for integration at a later stage. With most parts now fitted, we dropped Kwagga off at The Hydraulic Connection, our main sponsors who did all the piping for us. This included brakes, fuel system and steering piping which was a huge help. Dual fuel filters and high capacity fuel pumps piped up by The Hydraulic Connection in the rear of Kwagga - 22 November 2012. From here on things are a bit of a blur as we battled to get Kwagga mobile! 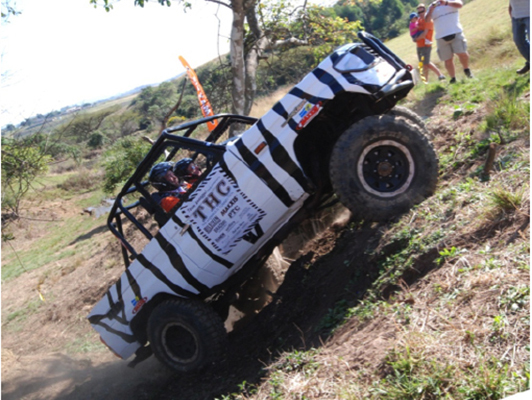 Many of our friends rolled up their sleeves and helped to get Kwagga ready for the first practice session on 26 January 2013, just 2 short weeks before the first event in the 2013 Maxxis South African National 4x4 X-Track Racing calendar! A sign of things to come? 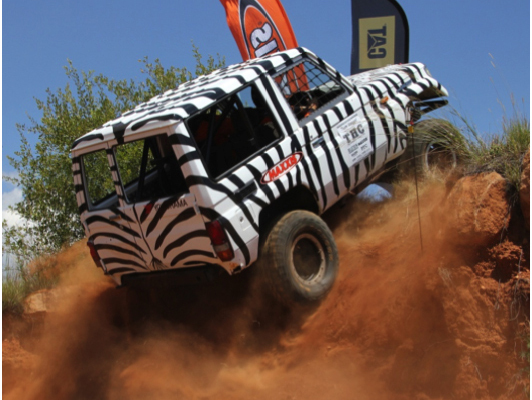 We put Kwagga on his side during the very first practice outing at Rayton on 26 January 2013! This practice session was very worthwhile because it highlighted a number of shortcomings in Kwagga’s setup. From steering oil that overheated causing Arno to lose power steering, to engine tuning that was horrible and prevented Arno from driving the way he is used to, to a fuse box that overheated causing various electrical malfunctions! In true Kwagga fashion, we learnt from the experience, fixed the faults, had the engine dyno tuned by Jan Blackie from Totally Tuned in Olifantsfontein and were ready for another practice session the next weekend! 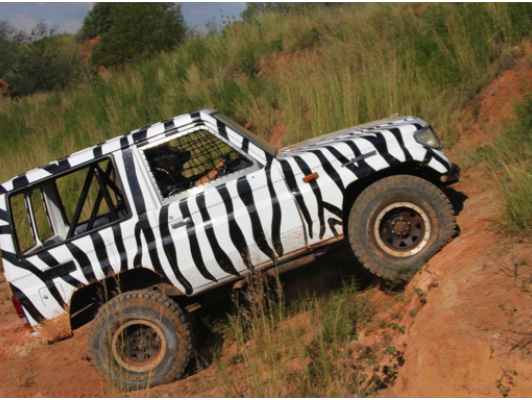 Sanette and I spent 9 solid hours on Sunday 27 January to cover Kwagga in his now familiar Zebra motive! Kwagga at our second practice session at Diamond-X Ranch near Rayton on 2 February 2013. We raced Kwagga in this format with great success at the Parys National the next weekend and walked away with a maiden victory! Kwagga on the way to a maiden win at Parys - 9 February 2013. During the Parys event, we found two shortcomings with Kwagga, 1. The transfer case cross member was a bit like a ship’s anchor when trying to cross sharp ridges and 2. The front radius arm suspension was very prone to “tramp” when Arno steps hard on the throttle, this rapid up-and-down jumping of the front wheels is a killer for front CV joints and side shafts! To address the problem with hanging up on the belly, Arno and I lay under Kwagga in his garage the next week and dreamt up a solution. 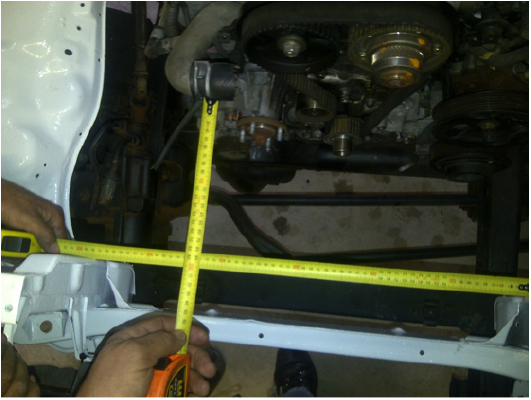 Paul Jordaan assisted by designing a new transfer case cross member that gave more belly clearance and also acted as a skid plate rather than an anchor! Laserfab did the laser cutting and bending again, Elinem Engineering machined parts for a new low-profile transfer case mounting and Arno and I finished off the job by fitting the whole lot. The problem of front wheel tramp was solved by fitting a unique Z-Factor 4-link front suspension layout. New parts were designed by me with Paul Jordaan once again helping with CAD files for laser cutting. Bradbri Engineering made the new solid EN19 condition T suspension arms complete with heavy duty rod-end bearings and spacers to reduce the 25mm eye inner diameter to 16mm for the standard suspension bolts. Elinem Engineering stepped up to the plate by machining a rear top mount with multiple mounting holes to allow us to change the suspension’s reaction under hard throttle. Carl van Vuuren helped by welding all the new parts on and we were ready to spin the front wheels without any more of that old tramp stuff! We were ready for the next event! 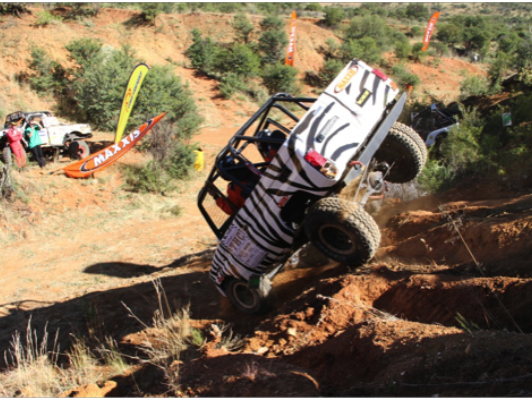 Kwagga going end-over-end at the Rustenburg National - 16 March 2013. Kwagga doing a tail-stand at Rustenburg - 16 March 2013. Arno managed to catch Kwagga 10 times after the initial roll to prevent us from rolling again! In a desperate attempt to salvage at least some points, we completely stripped the rear crown wheel and blew a front CV joint into a gazillion pieces! All in vain though as we had to hobble home with zero Championship points to show for our efforts! 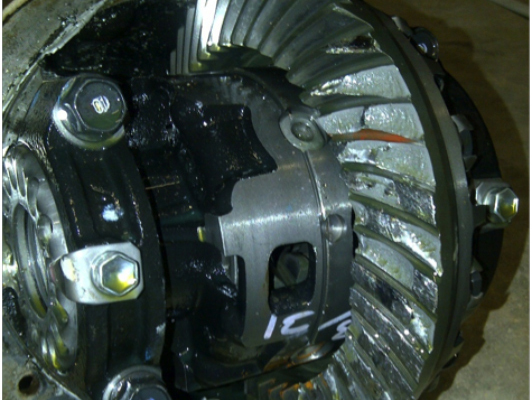 The picture above shows what the rear differential crown wheel looked like after Arno had given that last extra little bit to try and get at least some points for us at Rustenburg! - 16 March 2013. 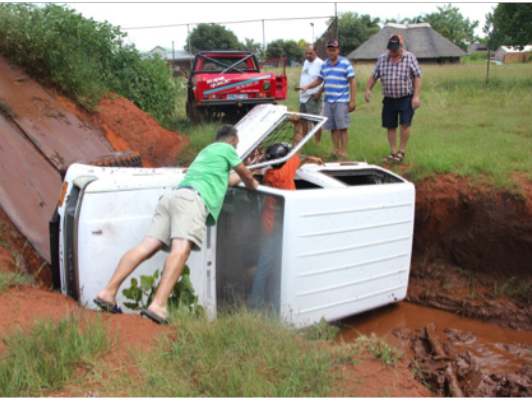 This led to a lot of emotional wound licking by us, but by the end of the week Kwagga was well on the way to a longer wheelbase without roof. 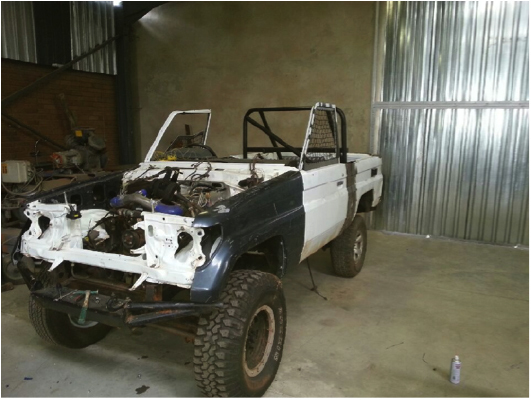 Our friends Lourens and Richard at LR Spraypainters in Brakpan did a sterling job to lengthen the chassis and bodywork while a new roll cage was fabricated by Hydro Turnkey in Boksburg. The Z-Factor chassis extension, CAD files by Paul Jordaan, laser cut and bending by Laserfab, welding by LR Spraypainters - 30 March 2013. The body was cut from side-to-side just behind the doors, then the rear and front sections were put in place - 30 March 2013. The 290mm gap between the front and rear sections was clad with steel plate, “new” front fenders and bonnet were fitted (remember that we squashed these parts badly during the forward roll at Rustenburg) and things were taking shape! - 4 April 2013. 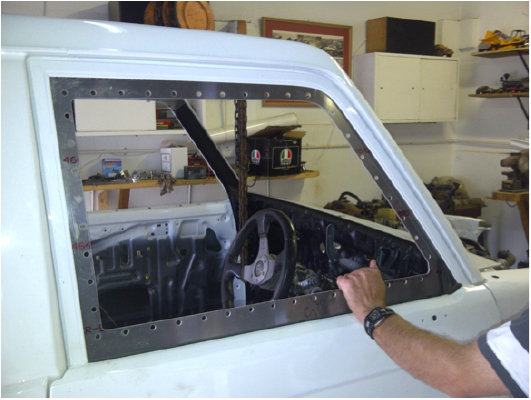 The roll cage was manufactured by Hydro Turnkey, the bodywork was panel beaten into shape and here Kwaagga (note the extra “a” in the middle!) was ready for spray painting - 21 April 2013. Kwagga back from the extension process, nearly ready to re-join the fight for the Championship! 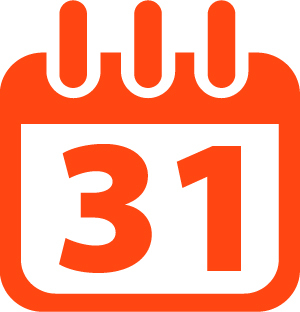 - 24 April 2013. The longer wheelbase and lowering of the centre of gravity thanks to losing the roof stood us in good stead at the Fochville event where we took the laurels again. Just imagine what this picture would have looked like with the original short wheelbase! - 27 April 2013. The next event was Durban 4 weeks later and Kwagga was still in one piece, so we used the time well to do some fine tuning. One thing we learned at the Fochville event was that the new 4-link front suspension was too soft in articulation and Kwagga listed badly on side slopes. So I designed a new anti-roll bar for the front suspension and with the help of Bradbri Engineering who made the anti-roll bar out of good old EN19 Cond. T and Elinem Engineering who machined the special brackets and clamps, Kwagga was fitted with a front anti-roll bar ready for the next event. Team Kwagga was at its best in Durban, everything that we had done worked and we won in convincing style - 25 May 2013. Although we won the Durban event going away, we managed to strip the crown wheel in the rear diff again! 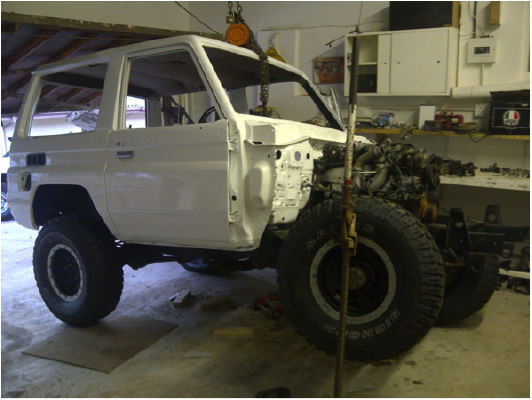 We immediately set about building a more or less bullet rear axle, starting with a wrecked rear axle out of a FJ79 pickup that we bought from Stuart Baillie Off Road near Kyalami. This was not an easy conversion, but thanks to Paul Jordaan who designed the weld-on bracket to accept the radius arm rear suspension, Joggie van der Westhuizen who welded everything together and various other friends who stepped in to get all the parts together required to rebuild the wrecked diff, we were ready to install it on 6 July. We were going great guns thanks to a helping hand from my neighbour Riaan Delport until it was time to fit the centre portion to the reworked diff housing, only to find that the diff lock motor interfered by about 60mm with the suspension arm and spring saddle! In true Team Kwagga fashion we made a plan and by the next weekend we had a perfect practice session with new pneumatic rear diff lock setup thanks to Mavtech Automation who supplied the pneumatics and Elinem Engineering who manufactured the mechanism for us! 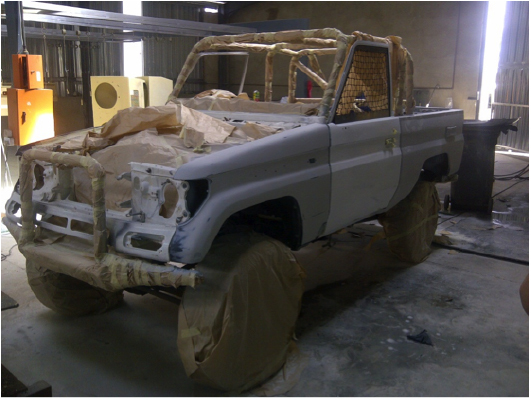 So, back to LR Spraypainters Kwagga went for a second round of anti-wrinkle treatment! 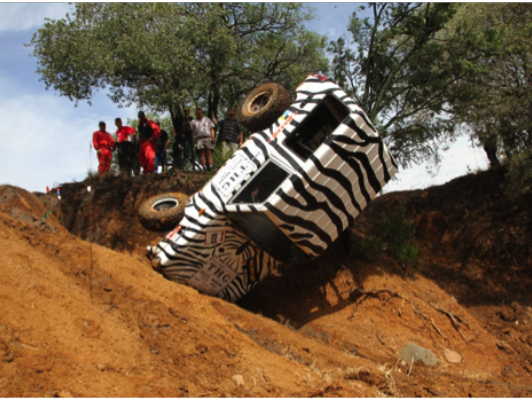 With new Zebra motive added on Friday 23 August, Team Kwagga was ready for the Brits National on 24 August. We arrived at the Brits event with a newly face-lifted Kwagga ready for the battle. Things went well till lunchtime, but then we lost control of the lead and ended up rolling Kwagga, first onto the right hand side and then, in our efforts to right the whole lot, we did a full 360 to the left to land on the right side again! Battered and bruised we limped home to lick our wounds. We finished 3rd for the day after leading by 50 points at lunch time, ouch! 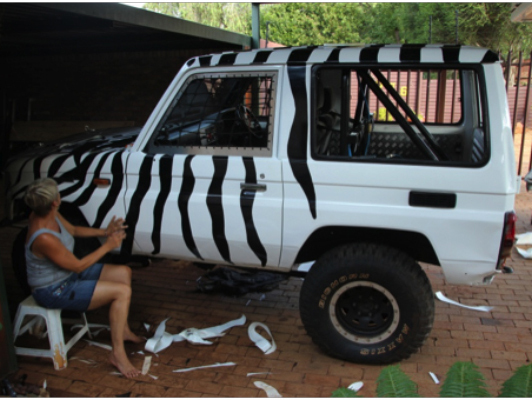 Carl Van Vuuren helped us the week after to rebuild and strengthen the battered roll cage. We decided to leave the wrinkled body panels as they are till the end of the season, Kwagga already carried a heavy enough burden in body putty! Spitronics engine management system with Spitronics supplied wasted spark coil-packs . Dyno tuned by Jan Blackie at Totally Tuned in Olifantsfontein, 132kW on the back wheels at 1 500m (5 000ft) altitude! For comparison purposes, my 1FZ 4.5 litre EFI engine pushed out only 75kW on Shaun van der Linde's dyno last year and it is rated at 160kW! Atmospheric dump valve fitted between turbo outlet and manifold inlet to improve throttle response, you can hear it hissing like a Spitting Cobra when Arno gets off the throttle in an obstacle. A purpose designed and built high capacity radiator was supplied by Ventura Engineering Equipment in Route 21 Park, Pretoria East. They supplied it complete with cowling and high capacity electric fan to keep the engine nice and cool thank you very much! This setup worked like a charm the whole of last season. 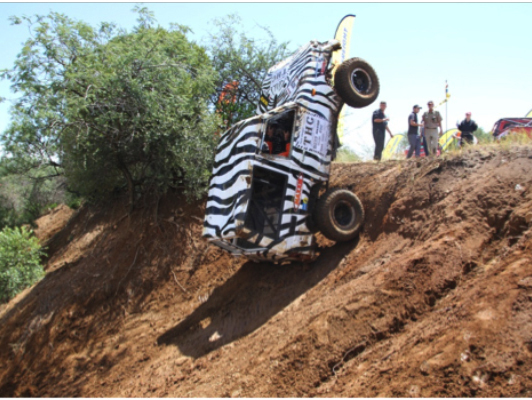 It even functioned as a sort of roll-cage early in the season when we rolled over the front at Rustenburg, preventing the bonnet from crushing all the way to the engine underneath it! The fuel tank is an aluminium racing fuel cell we bought from ATS in Randburg. We run duel fuel pumps for redundancy. Each pump has a Parker strainer (bought from Turboformance near Nelspruit, info@turboformance.co.za) between it and the fuel cell to prevent debris from jamming the pump. The strainer has a coarse mesh (250micron) to reduce suction pressure drop which is a fuel pump killer! Downstream of the pumps a fine particle inline filter serves filtered petrol to the common rail feeding the injectors. Fuel rail pressure is regulated to 3bar at idle and low RPM's, when the turbo starts boosting, the regulator increases the pressure, but I'm not sure to what pressure as things get sort of hectic inside the cab when that turbo starts talking! Dunno from what model Toyota, but it’s a standard Toyota part we bought from EAS, this was a great start to an engine swop! The standard Land Cruiser clutch, pressure plate and flywheel are handling the abuse well so far, no need for tricks in this department yet! 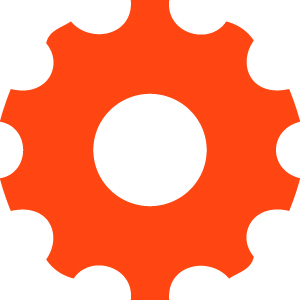 Gearbox is a 76 Cruiser unit coupled to a Cruiser part time 4x4 gear driven transfer case. We imported a rear prop shaft disconnect for a Hilux transfer case from Trail Tough in the USA. The output shaft of the Cruiser transfer case is a lot bigger than the Hilux, so the good guys at Bradbri Engineering in Boksburg machined new parts to adapt it to our Cruiser transfer case. Connect / disconnect of the rear prop shaft is by pneumatic cylinder supplied by Mavtech Automation in Centurion. They also supplied the valve, industrial quality Knorr-Bremse 12V compressor, air reservoir and piping. With the rear prop shaft disconnected, we can spin the front of Kwagga around in those really tight sections that are common in this type of competition. The transfer case selector lever gate was removed so we can select low range rear wheel drive when we want to spin the rear around, although this is not nearly as effective as spinning the front wheels around which can be turned in the desired direction. Special high torque units hand built by Bradbri Engineering in Boksburg, these tough babies comfortably handled all the abuse Arno dealt out the whole of the 2013 season! The front diff centre portion is a 105 Cruiser high pinion unit with standard Toyota electric locker and 4.3 ratio that we bought new from Toyota, we don't talk about the price in polite conversation! Crown wheel and pinion gear teeth were super finished by hand (I did this myself with a Dremel tool, damn nearly killed me!) and shot peened by GJ Engineering to improve strength and fatigue life. Elinem Engineering stepped up to the plate and imported 4340 Chrome-moly 30-spline side shafts made-to-length by Marlin Crawler in the USA. These were complemented by Marfield 30-spline CV joints made from Chrome-moly & 300M high strength steels also from Marlin Crawler. The manual hubs on the wheel-ends were machined by Elinem Engineering to increase the stud count to 12, double the normal number for increased strength when the going gets ridiculous! 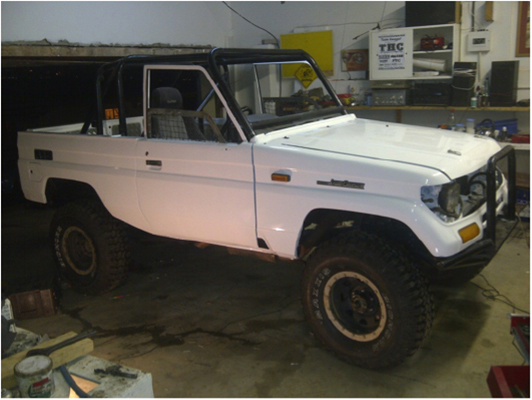 The rear axle started as a Land Cruiser FJ79 bakkie unit that we bought from Baileys Off Road near Kyalami. The axle came from an ex mining bakkie and its condition was shocking, but we bought it for a good price, thank you very much! Arno's friend Kobus Venter (Venter's Gearboxes near Walmansthal, north of Pretoria) rebuilt the centre portion with new bearings and second hand 4.3 ratio crown wheel and pinion and fresh bearings all round. Damn, those genuine Toyota bearings are expensive! The crown wheel & pinion received the same loving treatment as the front parts before installation. New wheel bearings, side shaft (the short one with the diff lock splines was broken by the miners that used the bakkie before us, we couldn't find a 2nd hand replacement anywhere so we had to buy a new one, ouch! ), diff lock dog and other parts were fitted to complete the rebuild. Paul Jordaan used the old (standard LJ71) rear axle (we blew the crown wheel on this one twice earlier in the season, hence the upgrade to the FJ79 diff) as template and designed new radius arm and Panhard rod mounting brackets which were welded onto the axle tube by Joggie van der Westhuizen at Paramount Land Systems where I work. The electric diff lock motor interfered completely with the right hand coil spring and radius arm so we converted the diff lock activation to pneumatics. Elinem Engineering machined and fabricated the mechanism while Mavtech Automation supplied the valves, piping and cylinder to complete the conversion. It works like a charm, very positive, quick and without the fussiness of the standard Toyota electric locker system. It started with a set of five 6-hole Pro White 16" x 7J steel rims. As part of the rear axle upgrade, we had to convert two additional 5-hole rims with bead-lock spacer rings to fit the FJ79 5-bolt pattern. Carl van Vuuren helped to have 5mm thick Z-Factor steel spacer rings that were laser cut by Mechatrans in Benoni (complete with 16 x 8.5mm diameter bolt holes) welded to the outside face of each rim. He also had them spray painted satin finish black. Added to this are new light weight Z-Factor aircraft grade aluminium bead-lock rings, also laser cut by Mechatrans. These are clamped onto the tyre bead with 16 x M8 high tensile bolts and Nyloc nuts. Tyres are Maxxis MT762 Bighorns 285/75 R16, the best in the business! We would have preferred the bigger diameter Maxxis Bighorn 315/75 R16's, but clearance inside the wheel wells is limited what with the current tyres already touching. Raising the body is not an option as this will reduce our side slope driving stability. We run the rear tyres on 0.5bar and the fronts on 0.6bar pressure to get the best traction and side slope grip without the tyres folding under. * Thick 16mm diameter piston rod. * New for the 2014 season is integrated hydraulic bump stops fitted inside each damper. This will make landing after lift-off much more controlled as the hydraulic stops absorb the landing energy versus rubber bump stops that act as springs and tend to throw the vehicle back into the air. Coil springs are specially designed and manufactured by Len Dockray from Mikem Suspensions in Johannesburg. Len and I have a long standing relationship dating back to 2001 when I designed the first RG32M armoured vehicle. The springs give a modest 50mm lift so we keep the centre of gravity low whilst improving angles of approach, departure and break-over. The steering box is the standard LJ71 Cruiser unit, we just turned the stopper screws on the axle heads in all the way so the rear of the inner wheel rubs against the radius arm at full turn to get the smallest possible turning circle. We fitted a large capacity ZF steering reservoir with large diameter suction pipe to ensure proper oil supply to the modified steering pump at all angles, possible and impossible! Added to this is a steering oil cooler supplied by Ventura Engineering Equipment mounted in front of the radiator to keep things cool. Front and rear bumpers are custom designed and manufactured Z-Factor items that help protect the vehicle a bit while improving angles of attack and departure. CAD design was done by Paul Jordaan and laser cutting and bending by Laserfab. Welding by Carl van Vuuren's guys at Wrought Iron Legends north of Pretoria. A special in-line OBP hydraulic hand brake bought from ATS Motorsport in Randburg is fitted between Arno and me and helps me to brake the rear wheels when we disconnect the rear prop shaft to help spin the front around when we need to turn really sharp! The body started out as a short wheel base LJ71, but at the second event we found that it was just too short for the inclines and declines encountered in 4x4 X-Track Racing! 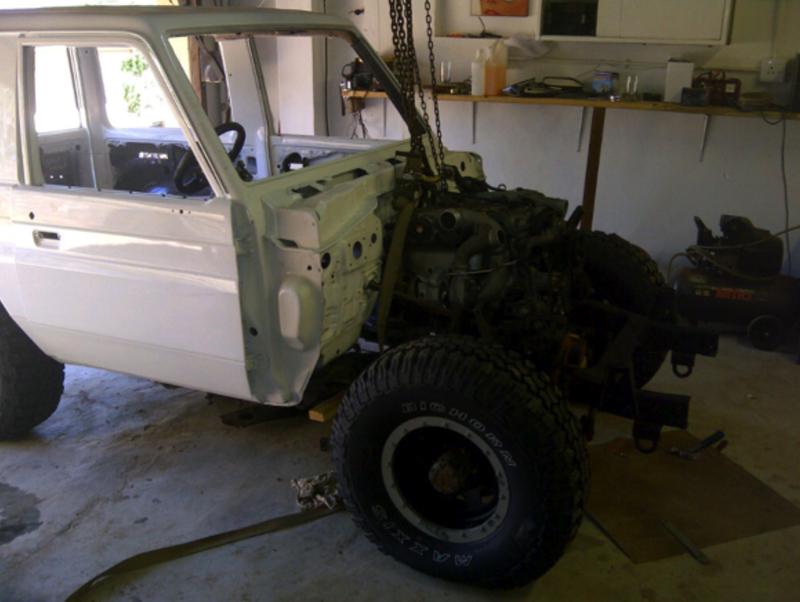 So we got our friends at LR Spraypainters in Brakpan to lengthen the body and chassis by 290mm so it now resembles a LJ73 convertible without a roof. Kwagga made regular return visits to LR Spraypainters since then to fix the dents that we picked up in our pursuit of the Championship! The 2014 roll cage is a complete new unit fabricated from 50 x 2mm steel tubing by Delberg Engineering in Sunderland Ridge, Centurion. This new unit now passes through holes cut in the floor of the body and bolts directly onto the chassis with made-to-order high tensile U-bolts manufactured by Conron Spring & Fasteners in Springs. The new roll cage is now 50mm higher than last year to give me a bit more headroom. Also new for the 2014 is that the roll cage now extends over the bonnet to the front bumper to give those precious new nose panels and bonnet a bit more protection in a roll-over, not that we plan any of those! In our experience, they just happen as a matter of fact…. At the end of last year we upgraded to a set of Cobra racing bucket seats from ATS Motorsport in Randburg. Arno complained on a number of occasions that the old seats did not hold him firmly in position and spoilt the feedback he was expecting from Kwagga underneath him. He did a whole day of practice at Moegatle in November and reports that the feedback is now improved 100%, we believe this is another positive step towards the 2014 Championship!